There are a lot of e-business security concerns. Knowing about e-business security issues will likely help overcome them. Keep in mind, companies that have control over their e-business are likely to prosper most. In other words, setting up and maintaining a secure e-business is essential and important to business growth. 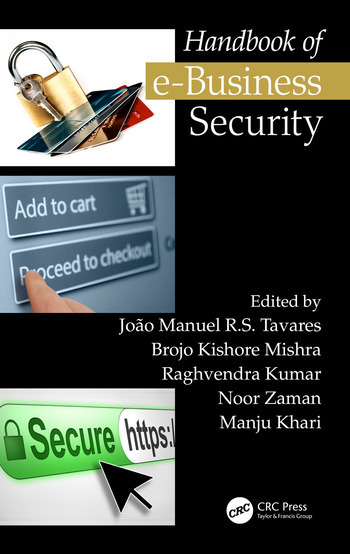 This book covers state-of-the art practices in e-business security, including privacy, trust, security of transactions, big data, cloud computing, social network, and distributed systems. Prof. João Manuel R. S. Tavares is graduated in Mechanical Engineering from the University of Porto, Portugal (1992). He also earned his M.Sc. degree and Ph.D. degree in Electrical and Computer Engineering from the University of Porto in 1995 and 2001, and the Habilitation in Mechanical Engineering in 2015. He is a senior researcher and project coordinator at the Instituto de Ciência e Inovação em Engenharia Mecânica e Engenharia Industrial (INEGI) and an Associate Professor at the Department of Mechanical Engineering of the Faculty of Engineering of the University of Porto (FEUP). Prof. João Tavares is co-editor of more than 35 books, co-author of more than 30 book chapters, 550 articles in international and national journals and conferences, and 3 international and 2 national patents. He has been a committee member of several international and national journals and conferences, is co-founder and co-editor of the book series "Lecture Notes in Computational Vision and Biomechanics" published by Springer, founder and Editor-in-Chief of the journal "Computer Methods in Biomechanics and Biomedical Engineering: Imaging & Visualization" published by Taylor & Francis, and co-founder and co-chair of the international conference series: CompIMAGE, ECCOMAS VipIMAGE, ICCEBS and BioDental. Also, he has been (co-)supervisor of several MSc and PhD thesis and supervisor of several post-doc projects, and has participated in many scientific projects both as researcher and as scientific coordinator. His main research areas include computational vision, medical imaging, human posture and gait, computational mechanics, scientific visualization, human-computer interaction and new product development. Dr. Noor Zaman has completed his PhD in IT from University Technology Petronas (UTP) Malaysia. He has 16 years of teaching and administrative experience internationally. He has an intensive background of academic quality accreditation in higher education besides scientific research activities, he had worked for academic accreditation for more than a decade and earned ABET accreditation twice for three programs at College of computer sciences and IT, King Faisal University Saudi Arabia. He also worked for National Commission for Academic Accreditation and Assessment (NCAAA), Education Evaluation Commission Higher Education Sector (EECHES) formally NCAAA Saudi Arabia, for institutional level accreditation. He also worked for National Computing Education Accreditation Council (NCEAC) Pakistan. He has experienced in teaching advanced era technological courses including, Android Programming, Mobile Computing and .Net programming besides other courses.